As most of you are aware, we have an exclusive relationship with illusion builder Frontier Magic. Well, these guys are stepping it up with a couple of really great illusions. 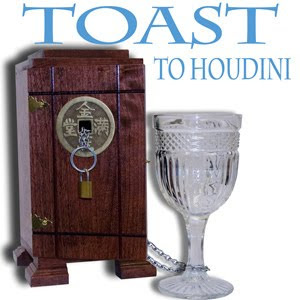 The first is “Toast to Houdini”. A brilliantly thought out and beautifully made piece of magic with a story written to draw an audience into the mystery and hold them to the very end. The first run of this item SOLD OUT in two days! Check for back-order info. 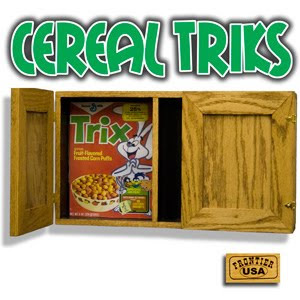 The next illusion is “Cereal Triks”. Talk about an idea whose time has come. “Cereal Triks” plays off the classic “Sucker Die Box”. However, here you get a prop that looks like a small kitchen cabinet, a box of cereal (gimmicked) and the unlimited potential for no-stop laughs. This effect is custom made for the magician doing schools shows, birthday parties or even the odd corporate gig. This stage prop works well for parlor too! As of the first of January 2011, Frontier Magic has now begun to burn its brand into each of its illusions. This guarantees that you will always be getting a quality piece of magic that comes out of the heart of Amish Country and built in the USA. 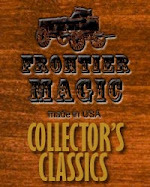 Check out the full line of Frontier Magic.